Rickets (synonym: vitamin D, "the English disease") is a common disease of the organism with a metabolic disorder, predominantly mineral, with a significant disorder of insufficient bone formation and function of some organs and systems. Rickets occurs more often in children aged 2 months to 1 year. Etiology and pathogenesis. Rickets is developed as a result of the lack of child organism of vitamin D insufficient use of it with food and in violation of natural formation in an organism under the influence, lack of ultraviolet radiation of the sun (see Ultraviolet failure). Vitamin D deficiency violates the hypothalamus and parathyroid glands, kidneys, intestines, which leads to the disorders of calcium and phosphorus metabolism in the body of the child, the lowering of the level of inorganic phosphorus in the blood. Modified acid-base balance in the direction of acidosis, it prevents the loss of dissolved in the blood of phosphorus and calcium and their deposition in the bones. Broken processes of calcification of the cartilage and osteodes tissue. Over and symptoms. Rickets is developing 2-3 months of age, most children with the wrong mode, are bottle-fed; in premature infants clinical symptoms of rickets can be found on the 3-4th week of life. Clinical manifestations depend on age, severity and course of the disease (see table). Initial symptoms are characterized by a change from the nervous system: anxiety, sweating, especially the head, a violation of sleep, fearfulness. In the midst of the disease is marked softening of the bones of the skull (craniotabes). The frontal and parietal mounds increase, head gets a square shape (Fig. 1). Changes the shape of the chest, the thicker ribs; at the crossing of the cartilage of the bone, there are so-called rosary. In severe diseases of the chest chest comes forward ("chicken breast) or strongly pressed ("chest shoemaker") (Fig. 2). Thicken the epiphyses of the bones of the forearm and phalanges ("bracelets"). After 6-8 months. twisted bones of the shoulder, pelvis and lower extremities (On - and X-shaped feet), which further violate the statics (Fig. 3,1). The teeth are cut in ahead of time (3-4 months) or trailing (10-12 months), violated the order of the eruption. Characteristic of rickets hypotension muscles, weakness and laxity of the muscles, weakness of ligaments, the consequence of this is loosening joints. Muscle hypotension develops gradually and detected by already developed changes in the bones of the skeleton, not earlier than 3 to 4 months. after birth. Hypotension muscles due to "frog's belly" (Fig. 4); in the supine position belly rings in hand. Children suffering from rickets, later than healthy start to sit, stand and walk. Tendon and abdominal reflexes decreased. Children with rickets are susceptible to respiratory diseases, often joins anemia. Fig. 3. Front legs with rickets. Fig. 4. "Frog's belly", curvature of the spine (kyphosis) in rickets. When the first degree of rickets are marked nerezko expressed changes from the nervous and skeletal systems. In the second degree are observed more expressed changes of the nervous, bone, muscle, blood-forming systems. Hepatomegaly, splenomegaly. The third degree is characterized by severe changes of all these organs and systems, there are changes on the part of the respiratory system, of cardiovascular system and gastrointestinal tract. 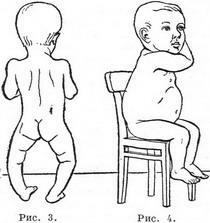 Acute most common in premature babies and children in the first 3 months of life and is characterized by rapid development of symptoms of rickets. 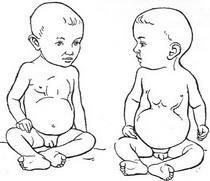 For subacute course is characterized by slow development of symptoms, the more children the second half life or in children with malnutrition (see Dystrophy in children). With recurrent course periods of remission process again replaced by the exacerbation of the disease; usually observed in immunocompromised children with chronic diseases and inadequate treatment. Biochemical changes are characterized by the reduction of inorganic phosphorus in serum before 3-1,5 mg%, by increasing the activity of alkaline phosphatase up to 30-60 units on Bogunskogo to 1.5-2 units according to Kay. Calcium is normal or reduced to 8.5 mg%. Radiograph shows osteoporosis and other violations of the development and growth of bones. Rickets [rachitis; from the Greek. rhachis - the spine, the spinal column; synonym: "the English disease" (rickets), vitamin D] - common disease with a metabolic disorder, predominantly mineral, with a significant disorder of bone formation and function of some organs and systems. The incidence of rickets is closely linked etiological with climatic, social and economic conditions of life of children. In pre-revolutionary Russia it was very high. After the great October socialist revolution was observed some decrease in the incidence of rickets. In the years of the great Patriotic war, the incidence of rickets has increased and it has become more difficult in comparison with the pre-war time. In the postwar years, the improvement of the material situation of the population, as well as broader and launching a campaign for struggle against rickets has led to almost universal disappearance of severe forms. But the incidence of children with rickets medium and light extent continues to remain high both in the USSR and abroad. The problem of anti-rickets remains one of the most actual problems in Pediatrics. The role of rickets in pathology in children is great; even mild symptoms of rickets modify the reactivity of the child's body, adversely affects the overall development and morbidity of children. Etiology. One of the etiological factors in the development of rickets already considered bad from General hygienic living conditions of the child: inadequate care, poor feeding, and adverse living conditions. Later value from General hygienic conditions in the etiology of rickets were summarized in two theories of light and alimentary. Light theory. Children, who have visited a lot of time in the sun, suffer from rickets rarely; in winter symptoms of rickets increase in spring and summer, the children live. A good result from the use of mercury-quartz lamps in rickets confirmed the importance of ultraviolet rays of the solar spectrum to protect children from rickets. Seasonal variations in the incidence of rickets also contributed to annual fluctuations of the intensity of UV radiation. In large cities of different fumes, smoke, soot and dust, delaying the ultraviolet rays that cause insufficient for the children active radiation and a significant incidence of rickets. Further elucidate the role of ultraviolet rays due to the discovery of vitamin D and studying anti-rickets action foods. Alimentary theory. Numerous observations indicated the impact of nutrition on the incidence of rickets. So, in children who were bottle-fed, there was a higher incidence than in breast-fed. Other errors in diet (for example, overfeeding in carbohydrates, especially seafood dishes, cereals, bread, pasta and others) also adversely affect the number of children rickets. At the same time, some food products protect children from rickets. In the North, in areas where the population uses eating lots of fish and fish oil, children are less likely to suffer rickets, despite adverse weather conditions. The favorable effect cod fat in rickets known for a long time. In fish oil have vitamin D, with a specific anti-rickets property. So came to the conclusion that rickets occurs due to insufficient content in the diet of anti-rickets factor of vitamin D.
The discovery of vitamin D was the impetus for the synthesis of alimentary and light theories, pre-existing independently. Later it became clear that different foods can purchase anti-rickets properties after their irradiation with ultraviolet rays. It was also established that education anti-rickets substances in the body when exposed to ultraviolet rays from the skin surface. Food sources of vitamin D, a little. Its main sources are almost exclusively animals and fish products (egg yolk, milk, butter, fish oil, eggs, liver, fish, and other animals. Cow's milk is often used in children's diet contains only a small amount of vitamin D in human milk he usually is almost absent. When exposed to lactating women ultraviolet light in her milk appears vitamin d In the skin of children under the influence of ultraviolet rays of sunlight or mercury-quartz lamps formed vitamin D3. Consequently, insufficient stay of children in the air and irrational feeding they can easily develop rickets. Nutritional and the light of the theory are reduced to a common position that one of the leading causes in the etiology of rickets is a deficiency (or, more precisely deficiencies) D.
In addition to this core, there are a number of other reasons contributing to the development of rickets. Among these, one should highlight the factors endogenous and exogenous order. Among endogenous factors include prematurity. Among premature infants there is increased incidence of rickets and earlier the beginning. Mostly sick children from 3 months to 2-3 years, i.e. in the period of strong growth. The nature of power of a woman, her lifestyle during pregnancy, especially in the second half, also have a big influence on the occurrence of rickets in the unborn child. The number of diseases in which there is a shift of the acid-alkaline balance in the direction of acidosis (for example, pneumonia, respiratory viral infection that occurs with metabolic disorders), contributes to the development of rickets. The pathogenesis of rickets is not yet fully understood. Vitamin D deficiency, resulting from insufficient exposure of the child to ultraviolet light or due to insufficient revenues him with food, leads to the breakdown of mineral metabolism. The primary factor in the pathogenesis of rickets is a violation of phosphorus metabolism with the development of gipofosfatemia. A decreasing number of inorganic phosphorus in the blood of children suffering from rickets, up to 1.5-2 mg% (in the norm of 4.5 to 5.5 mg%). In the development of gipofosfatemia great importance is attached to the abnormal function of the parathyroid glands that regulate (and vitamin D) and phosphorus metabolism. The lack of vitamin D in the body activates activity of the parathyroid glands; they emit large quantities of parathyroid hormone increases the excretion of phosphate in the urine due to a significant reduction in their reabsorption in the renal tubule. With the depletion of the body's phosphorus is the reduction of oxidative processes, develops acidosis. The latter contributes to the observed with rickets reducing the number of citric acid in the serum, leading to the accumulation of non-completely oxidized products of splitting carbohydrates. Hypophosphatemia and acidosis impede deposition of calcium salts in forming bones, the bones become soft, pliable to mechanical stress. Important here is the decrease in the content of magnesium in the blood, especially during the peak of the disease. Observed in children with rickets irritability, sweating, hypotension muscles reveal a violation of some regulatory functions of the nervous system. In rickets is broken and protein metabolism due to the reduction reabsorption of amino acids in the renal tubules. Loss of amino acids promotes and mineral imbalance. Great importance is also attached to the breach of education of the complex calcium + citric acid that plays an important role in the transportation of calcium. Observed in rickets failure of other vitamins (C, b and A) also influences the development of the pathological process.